The Chicago Bears have had some extra time to process their Week 1 loss to the Houston Texans, and they’ll hope to put the lessons from the defeat to good use when they take on the Philadelphia Eagles on Monday night. The Bears, who will open the home portion of their schedule Monday night, fell by a 23-14 margin to the Texans in Week 1, as their offense sputtered to a halt in the second half and their defense gave up big games to Lamar Miller, Will Fuller, and Brock Osweiler. This time around, the Bears will be looking to defeat an Eagles team that beat the Cleveland Browns in Week 1 of the regular season. Carson Wentz had a stellar game in his NFL debut in Week 1, throwing for 278 yards and two touchdowns as the Eagles knocked off the Browns and got their season off to a flying start. So just how can the Bears defeat the Eagles and get their record back to the .500 mark? Here are three keys to victory for the Monsters of the Midway. The Bears made generating a pass rush a priority during the offseason, drafting Leonard Floyd and Jonathan Bullard and bringing in players like Danny Trevathan and Jerrell Freeman in free agency. In their first game against the Texans, the Bears had some early success in getting to Osweiler, but as the game wore on their pass rush lost effectiveness as Houston’s defense moved the ball with impunity. If the Bears are going to get Wentz off of his game, then they have to get their blitzes and pass rushes home. Floyd is going to be vitally important in that regard, as he basically was a non-entity as soon as he was hit with blocks in Week 1. If he can get more pressure off his speed rush, and if the Bears can come up with different looks for their blitz packages, then the Eagles’ offense could suffer the consequences as a rookie quarterback makes his first road start. The Bears utilized Jeremy Langford a fair amount during their Week 1 defeat, but they failed to get Jordan Howard involved in the game at all and largely abandoned the run during various chunks of the contest. If the Bears are going to have a better overall offensive effort against Philadelphia, then it will all start by taking advantage of blockers like Josh Sitton and Kyle Long in the middle of their offensive line. That means getting more action for the physically-imposing Howard and utilizing Langford’s speed to provide a nice change of pace into the mix. The Eagles gave up 120 rushing yards on 21 attempts by the Browns in Week 1, and with a per-carry average of nearly six yards, the Bears have to be looking at that number as something to shoot for. Langford has the speed to make tacklers miss, but the Bears have to remain steadfastly committed to the run in order to get their offense moving in the right direction. The Bears quite possibly will not face a better pass rush than they did in Week 1, but even with quality players like Whitney Mercilus, JJ Watt, and Jadaveon Clowney opposing them, the effort from the Bears’ tackles in Week 1 cannot be repeated. Charles Leno Jr. and Bobby Massie missed several key blocks against the Texans, and as a result Jay Cutler was knocked to the turf regularly in the loss. 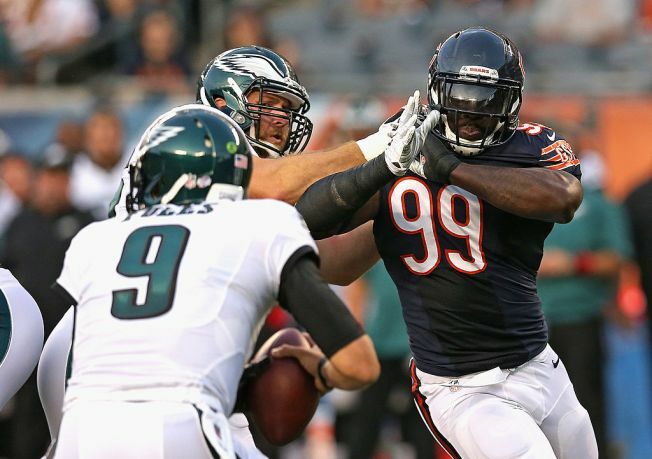 With the team’s offense still looking to establish an identity, the Bears’ blockers have got to do a more effective job against a less-potent Philadelphia pass rush, and it starts with the tackles on the outside.